The history of Absurd started on January 2, 1992 in a small Thuringian town, when Wolf, Sebastian 'DMD' S., and Hendrik 'JFN' M. decided to respond to the New Wave of Black Metal with a band of their own. The choice of the band name remains apocryphal and stands open to multiple interpretations. It is correctly assumed there's a link between the band name and one of the favorite hobbies of the band members at this time, though: Watching horror B-movies. It was soon decided that Wolf ought to manage the band affairs while the other two went to record a promo "God's Death" in June 1992. The band frequented a rehearsal place in a local "youth center" that was supervised by municipal social workers, and soon Sebastian 'DMD' S. managed to shock the local YMCA chapter, that used to meet at the same place, with his juvenile outbursts of 'Satanism' and 'Horror fantasies'. After inquiries by the social workers, who wanted to investigate whether or not Absurd pose a threat, and escalating conflicts with other bands rehearsing at this "youth center", the band eventually retreated into a cabin located in dense forest outside of their hometown. Meanwhile, a new member came to the band, Udo 'Damien Thorn' H. In late 1992, Absurd recorded the 'Death form the Forest' demo, and the band subsequently became a duo again. As such they recorded "God's Death/Sadness" split demo in March 1993. Barely a month after, a conflict between Sebastian 'DMD' S. and a schoolmate, who was two years younger, escalated with the killing of the latter. Sebastian 'DMD' S. and Hendrik 'JFN' M. were sent to youth detention center to serve a maximum of eight years respectively, whereas the third accomplice, Andreas K., received a sentence of six years. He joined the band as 'Surt' when the trio was together behind bars in 1994 and 1995. The trio infernale wasted no time while being behind bars. They recorded a rehearsal "Out of the Dungeon" in April 1994. The band subsequently decided to prepare for a full-length album. The youth detention center kindly provided all the instruments, equipment, and the facility for rehearsing and recording. During late 1994 and early 1995, Absurd started the production of their first album entitled "FactaLoquuntur". Alas, the band involuntarily aborted the recordings when prison administration decided to relocate the three of them to different facilites for the next three years. The recordings were subsequently used for the "Thuringian Pagan Madness"- EP in 1995, the "Facta Loquuntur"- CD/LP in 1996, and the "Totenburg"- SplitEP with Heldentum in 1997. In prison, Absurd matured ideologically as well as lyrically. While their earlier works largely reflected the influences they received from music, movies, and juvenile delusions of grandeur; the band ultimately started to use their music and lyrics for the sake of having an impact, and influencing, their ever growing audience. It was now when Sebastian 'DMD' S. and Hendrik 'JFN' M. adopted a world view based upon their Germanic ancestry, the Heathen values and virtues of their elders, and the esoteric currents of National Socialism. After their release from youth custody in 1998, Sebastian 'DMD' S. and Hendrik 'JFN' M. came together in a mutual effort to revive Absurd, once more. They recorded the "Asgardsrei"- MCD/LP, which has been hailed as a cornerstone of the nascent NSBM-scene at that time. Due to the increasingly difficult situation in Germany, Hendrik 'JFN' M. eventually departed from his band and his homeland in late 1999. While Hendrik 'JFN' M. went across the ocean to work with Resistance Records, where he was arrested as an 'international fugitive' in August 2000 and deported to Germany a year later, and Sebastian 'DMD' S. was abandoning Absurd in favor of Halgadom, Wolfsmond, In Acht & Bann, it was Wolf who took care of Absurd from here on. He assumed the position of vocalist, and together with Sven 'Unhold' Z. (Hellfucked, Luror) he recorded a new album, "Werwolfthron", in 2000. That album featured songs and lyrics written by Sebastian 'DMD' S. that remained unrecorded hitherto. 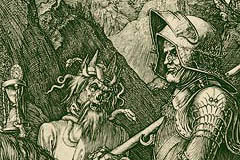 When Hendrik 'JFN' M. was put behind bars once again, sentenced to a prison term of another six years altogether, Wolf and Sven 'Unhold' Z. continued to release more Absurd records - a Split-CD with Pantheon from USA, the album "Totenlieder" as well as the album "Blutgericht" and also two MCD's, "Raubritter" (w/o the contribution from Sven 'Unhold' Z.) and "Grimmige Volksmusik". When they ran out of songs composed by Sebastian 'DMD' S. and lyrics written by either him or Hendrik 'JFN' M., they started to use lyrics and music of their own. From 2004 on, Wolf started to recruit musicians, from various bands like Totenburg, Antiphrasis, (and later in 2007 also) Leichenzug, Suicide Solution, to be temporary session members on stage, and Absurd played concerts in several countries (in 2004 they went live on stage w/o Sven 'Unhold' Z. who would become the permanent live guitarist and background vocalist only two years later) and successfully headlined festivals in Romania, Italy and elsewhere. Hendrik 'JFN' M. returned from prison in 2007 and he immediately drafted the concept for the anniversary release "Der fünfzehnjährige Krieg" as well as providing the lyrics for the "Weltenfeind"-Split w/ Sigrblot and Grand Belials Key. Both records were published in 2008 and they mark the pinnacle of the creative era accomplished by Wolf and Sven 'Unhold' Z. They played a few more concerts with Absurd but all band activity went into hiatus after their last live gig in Italy, in October 2012. Two 7" EP's, featuring hitherto unreleased songs or live recordings, were published in 2014 and 2015 respectively. 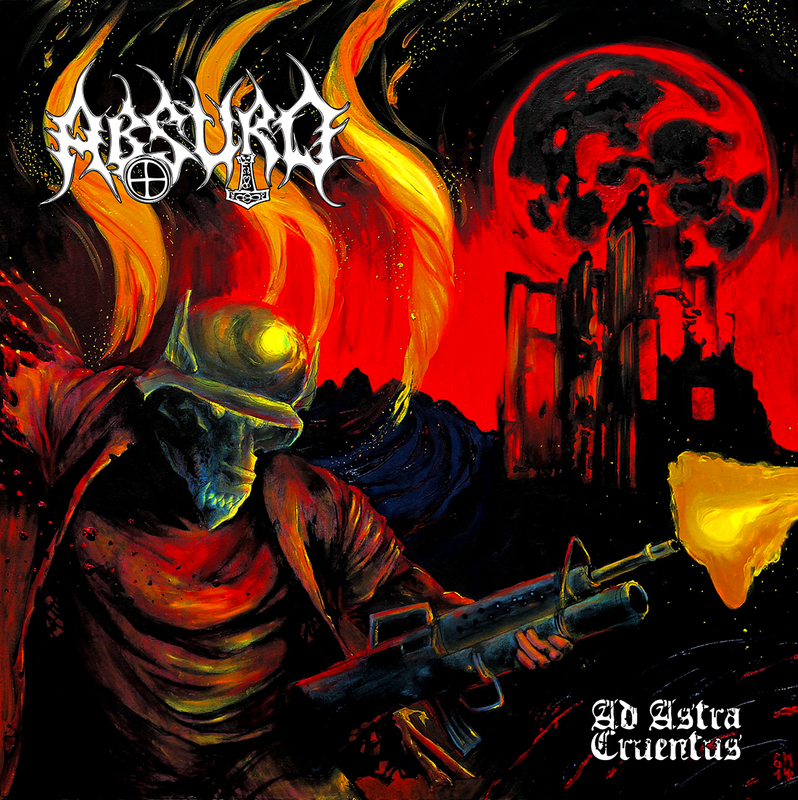 A new full length-album "Ad Astra Cruentus" was announced in 2014 but remains unfinished / unrecorded. With the interest, of fans and bookers worldwide, in Absurd still persisting - despite all the years of inactivity - Wolf contemplated the relaunch of the band with a new line-up and different concept but he called it quits, at last. Of the three original members of Absurd, only one was left who would be willing, able and ready to carry on with the band. Hendrik 'JFN' M. enlistened new session members, two of them being veterans of German Black Metal actually, and together they started rehearsing and preparing for bringing Absurd back on stage in late 2017.